Reconstructions of human evolution are prone to simple, overly-tidy scenarios. Our ancestors, for example, stood on two legs to look over tall grass, or began to speak because, well, they finally had something to say. Like much of our understanding of early hominid behavior, the imagined diet of our ancestors has also been over-simplified. Probably didn’t have a lot of time to whip up coconut flour pancakes back then…. Take the trendy Paleo Diet which draws inspiration from how people lived during the Paleolithic or Stone Age that ran from roughly 2.6 million to 10,000 years ago. It encourages practitioners to give up the fruits of modern culinary progress – such as dairy, agricultural products and processed foods – and start living a pseudo-hunter-gatherer lifestyle, something like Lon Chaney Jr. in the film One Million BC. Adherents recommend a very specific “ancestral” menu, replete with certain percentages of energy from carbohydrates, proteins and fats, and suggested levels of physical activity. These prescriptions are drawn mainly from observations of modern humans who live at least a partial hunter-gatherer existence. But from a scientific standpoint, these kinds of simple characterizations of our ancestors’ behavior generally don’t add up. Recently, fellow anthropologist C. Owen Lovejoy and I took a close look at this crucial question in human behavioral evolution: the origins of hominid diet. We focused on the earliest phase of hominid evolution from roughly 6 to 1.6 million years ago, both before and after the first use of modified stone tools. This time frame includes, in order of appearance, the hominids Ardipithecus and Australopithecus, and the earliest members of our own genus, the comparatively brainy Homo. None of these were modern humans, which appeared much later, but rather our distant forerunners. We examined the fossil, chemical and archaeological evidence, and also closely considered the foraging behavior of living animals. Why is this crucial? Observing animals in nature for even an hour will provide a ready answer: almost all of what an organism does on a daily basis is simply related to staying alive; that includes activities such as feeding, avoiding predators and setting itself up to reproduce. That’s the evolutionary way. Scraping ancient teeth for clues about diet. What did our ancestors actually eat? In some cases, researchers can enlist modern technology to examine the question. Researchers study the chemical makeup of fossil dental enamel to figure out relative amounts of foods the hominid ate derived from woody plants (or the animals that ate them) versus open country plants. Other scientists look in ancient tooth tartar for bits of silica from plants that can be identified to type – for example, fruit from a particular plant family. Others examine the small butchering marks made on animal bones by stone tools. Researchers have found, for example, that hominids even 2.6 million years ago were eating the meat and bone marrow of antelopes; whether they were hunted or scavenged is hotly debated. Such techniques are informative, but ultimately give only a hazy picture of diet. They provide good evidence that plants’ underground storage organs (such as tubers), sedges, fruits, invertebrate and vertebrate animals, leaves and bark were all on the menu for at least some early hominids. But they don’t give us information about the relative importance of various foods. And since these foods are all eaten at least occasionally by living monkeys and apes, these techniques don’t explain what sets hominids apart from other primates. So how should we proceed? As my colleague Lovejoy says, to reconstruct hominid evolution, you need to take the rules that apply to beavers and use them to make a human. In other words, you must look at the “rules” for foraging. We aren’t the first researchers to have dabbled in this. 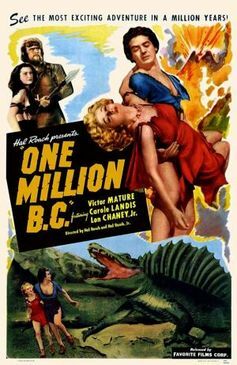 As long ago as 1953, anthropologists George Bartholomew and Joseph Birdsell attempted to characterize the ecology of early hominids by applying general biological principles. Happily, ecologists have long been compiling these rules in an area of research dubbed optimal foraging theory (OFT). OFT uses simple mathematical models to predict how certain animals would forage in a given circumstance. For instance, given a set of potential foods of estimated energetic value, abundance and handling time (how long it takes to acquire and consume), one classic OFT model calculates which resources should be eaten and which ones should be passed over. One prediction — sort of a “golden rule” of foraging — is that when profitable foods (those high in energy and low in handling time) are abundant, an animal should specialize on them, but when they are scarce, an animal should broaden its diet. Himalayan gray langurs in early fall when the living is comparatively easy and there’s no need to fall back on ‘nonprofitable’ foods. Data from living organisms as disparate as insects and modern humans generally fall in line with such predictions. 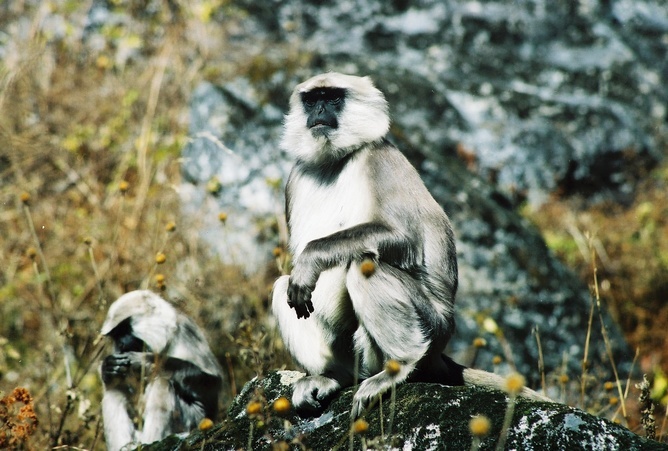 In the Nepal Himalaya, for example, high-altitude gray langur monkeys eschew leathery mature evergreen leaves and certain types of roots and bark — all calorie-deficient and high in fibers and handling time — during most of the year. But in the barren winter, when better foodstuffs are rare or unavailable, they’ll greedily devour them. In another more controlled study, when differing quantities of almonds in or out of the shell are buried in view of chimpanzees, they later recover larger quantities (more energy), those physically closer (less pursuit time), and those without shells (less processing time) before smaller, more distant, or “with-shell” nuts. This suggests that at least some animals can remember optimal foraging variables and utilize them even in cases where foods are distant and outside the range of immediate perception. Both of these studies support key predictions from OFT. If one could estimate the variables important to foraging, one could potentially predict the diet of particular hominids that lived in the distant past. It’s a daunting proposition, but this human evolution business was never meant to be easy. The OFT approach forces researchers to learn how and why animals exploit particular resources, which leads to more thoughtful considerations of early hominid ecology. 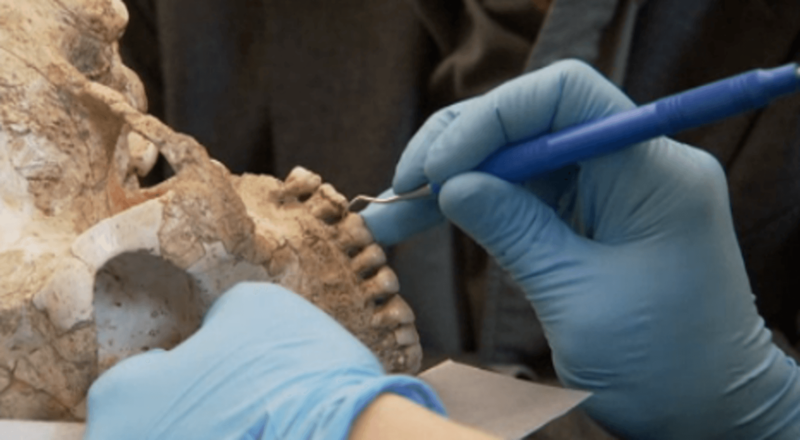 A smattering of scientists have utilized OFT with success, most notably in archaeological treatments of comparatively recent hominids, such as Neandertals and anatomically modern humans. A skull of so-called ‘Nutcracker Man’ – hungry for anything. But a few brave souls have delved into more remote human dietary history. 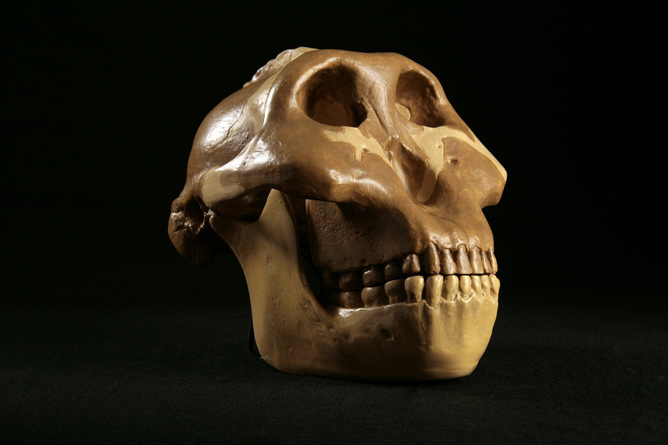 One team, for example, utilized OFT, modern analogue habitats, and evidence from the fossil record, to estimate the predicted optimal diet of Australopithecus boisei. 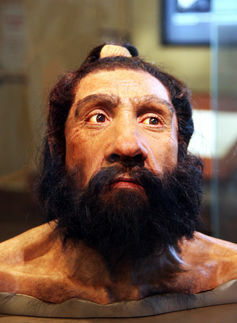 That’s the famed “Nutcracker Man” that lived in East Africa close to 2 million years ago. The research suggests a wide range of potential foods, greatly varying movement patterns – based on characteristics such as habitat or use of digging sticks — and the seasonal importance of certain resources, such as roots and tubers, for meeting estimated caloric requirements. Researchers Tom Hatley and John Kappelman noted in 1980 that hominids have bunodont – low, with rounded cusps – back teeth that show much in common with bears and pigs. If you’ve watched these animals forage, you know they’ll eat just about anything: tubers, fruits, leafy materials and twigs, invertebrates, honey and vertebrate animals, whether scavenged or hunted. The percentage contribution of each food type to the diet will depend (you guessed it) on the energetic value of specific foods in specific habitats, at specific times of year. Evidence from the entirety of human evolution suggests that our ancestors, and even we as modern humans, are just as omnivorous. And the idea that our more ancient ancestors were great hunters is likely off the mark, as bipedality — at least before the advance of sophisticated cognition and technology — is a mighty poor way to chase game. Even more so than bears and pigs, our mobility is limited. The anthropologist Bruce Latimer has pointed out that the fastest human being on the planet can’t catch up to your average rabbit. Another reason to be opportunistic about food. Don’t underestimate the flexibility of early hominids such as this Neandertal. Simple characterizations of hominid ecology are divorced from the actual, and wonderful, complexity of our shared history. The recent addition of pastoral and agricultural products to many modern human diets — for which we have rapidly evolved physiological adaptations — is but one extension of an ancient imperative. 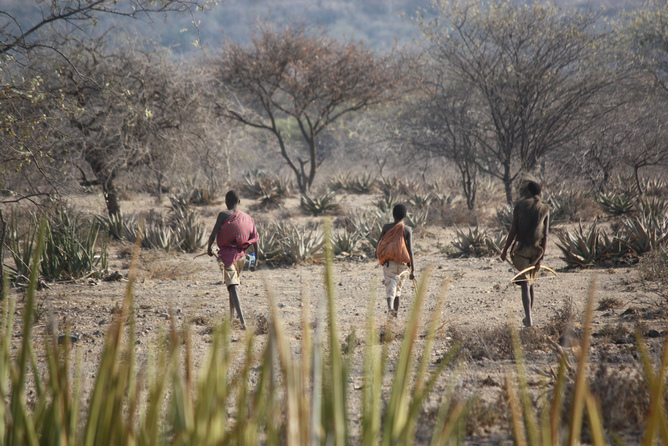 Hominids didn’t spread first across Africa, and then the entire globe, by utilizing just one foraging strategy or sticking to a precise mix of carbohydrates, proteins and fats. We did it by being ever so flexible, both socially and ecologically, and always searching for the greener grass (metaphorically), or riper fruit (literally).